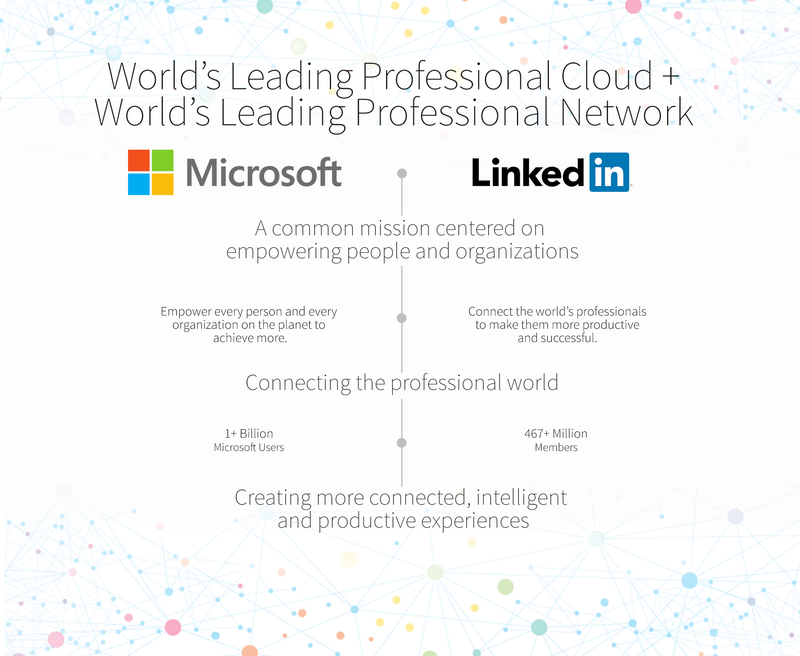 Today we are excited to share that LinkedIn has entered into an agreement to be acquired by Microsoft. We are joining forces with Microsoft to realize a common mission to empower people and organizations. LinkedIn’s vision – to create economic opportunity for every member of the global workforce – is not changing and our members still come first. Our companies are the world’s leading professional cloud and network. This deal will allow us to keep growing, investing in and innovating on LinkedIn to drive value for our members and our customers. Our members will continue to develop their skills, find a job and be great at that job, using our platform. We will continue to help our customers hire top talent, market their brand, and sell to their customers. The LinkedIn you know and value is only getting better. LinkedIn will retain its distinct brand, culture and independence. We’ve been changing the way the world’s professionals have connected to opportunity for 13 years, and this is an opportunity for us to truly change the way the world works on a massive scale. I’m incredibly energized by what this means for our members and employees, and for my personal perspective on this news, I encourage you to read my Influencer post. You can find more details on the agreement on the Microsoft News Center and the LinkedIn Newsroom. In connection with the transaction described above, LinkedIn Corporation (the “Company”) will file relevant materials with the Securities and Exchange Commission (the “SEC”), including a proxy statement on Schedule 14A. Promptly after filing its definitive proxy statement with the SEC, the Company will mail the definitive proxy statement and a proxy card to each stockholder entitled to vote at the special meeting relating to the transaction. INVESTORS AND SECURITY HOLDERS OF THE COMPANY ARE URGED TO READ THESE MATERIALS (INCLUDING ANY AMENDMENTS OR SUPPLEMENTS THERETO) AND ANY OTHER RELEVANT DOCUMENTS IN CONNECTION WITH THE TRANSACTION THAT THE COMPANY WILL FILE WITH THE SEC WHEN THEY BECOME AVAILABLE BECAUSE THEY WILL CONTAIN IMPORTANT INFORMATION ABOUT THE COMPANY AND THE TRANSACTION. The definitive proxy statement, the preliminary proxy statement and other relevant materials in connection with the transaction (when they become available), and any other documents filed by the Company with the SEC, may be obtained free of charge at the SEC’s website (http://www.sec.gov) or at LinkedIn’s website (http://investors.linkedin.com) or by writing to LinkedIn Corporation, Investor Relations, 2029 Stierlin Court, Mountain View, California 94043. The Company and its directors and executive officers are participants in the solicitation of proxies from the Company’s stockholders with respect to the transaction. Information about the Company’s directors and executive officers and their ownership of the Company’s common stock is set forth in the Company’s proxy statement on Schedule 14A filed with the SEC on April 22, 2016. To the extent that holdings of the Company’s securities have changed since the amounts printed in the Company’s proxy statement, such changes have been or will be reflected on Statements of Change in Ownership on Form 4 filed with the SEC. Information regarding the identity of the participants, and their direct or indirect interests in the transaction, by security holdings or otherwise, will be set forth in the proxy statement and other materials to be filed with SEC in connection with the transaction.